On a Friday morning late last spring, bell hooks was sitting comfortably on a couch perfectly situated in a spacious single-family home that Berea College purchased and had since converted into an Institute bearing her name. On this particular day, hooks — arguably one of the nation’s most prominent authors and feminist scholars — was interested in talking legacy — hers and other Black writers. ­That was the impetus for the creation of the bell hooks Institute, which was founded in 2014 by hooks and headquartered at Berea — the small liberal arts work college where no student pays tuition. For hooks, legacy is not the same as an archive, although both are critically important. ­That spirit of self-determination has been a guiding force for hooks who has turned the institute into a place where locals can engage in discussion about a variety of present-day issues. Because of who she is, hooks has been able to attract high-profile scholars such as Dr. Cornel West and Laverne Cox, the transgender actress and LGBTQ advocate. Like Cox, actress Emma Watson, called hooks’ assistant several years ago and requested a meeting. For hooks — who does not use the Internet and continues to read a book every day — the Institute has been the gathering place where students and everyday people can engage in intimate conversations with some of the nation’s most celebrated thought leaders. After retiring from IBM/Lexmark in 2008, Baker began working at Boone Tavern, the local hotel owned by Berea College. ­The opportunity to engage in a dialogue with West was life transforming for Baker. hooks — who coauthored Breaking Bread: Insurgent Black Intellectual Life with West — has shared a long friendship with the philosopher stretching back to their days as faculty members at Yale. West’s criticism of President Obama across the years has hurt his cause, says hooks. 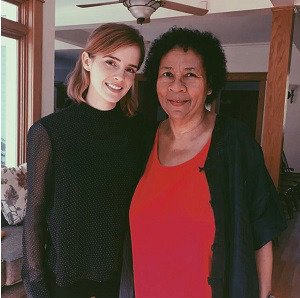 Aft­er a storied career teaching at some of the nation’s most established institutions, hooks — who was born Gloria Jean Watkins and later took the pen name bell hooks from her great grandmother Bell Blair Hooks — decided to return to Kentucky to be closer to her parents. bell hooks speaking at an event. “Our parents were really aging and it was clear that they were not going to be around for many more years, and I wanted to be near them,” says hooks, who is one of seven children. A­fter a talk at Berea College, she fell in love with the institution and the students that it serves. 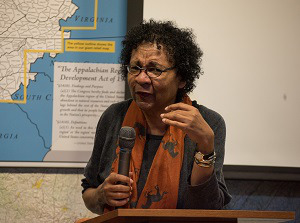 Now a Distinguished Professor in Residence in Appalachian Studies, hooks says that Berea College provides her with the opportunity to pursue her interests. “Part of what Berea has offered me through wonderful administrators is the freedom to be as I am, to think as I want, to have this space,” she says of the institute, which she raises funds to support. That fierce independence, she notes, is not common in everyday society. “I think that on some level, we’ve all been diminished by academic institutions becoming where we’re housed,” she says. Earlier this year, hooks was inducted into the Kentucky Writers Hall of Fame, a recent highlight of her fascinating career. An earlier pioneer in Black feminism, hooks says that she is profoundly worried about the direction of the feminist movement. “I don’t know where we are,” she says. “I feel like we’ve gone in a negative direction in thinking that feminism is about women against men; that thinking it’s only about issues having to do with sexuality and not that it’s really about a larger framework of self-actualization. For hooks, “White supremacy trumps feminism,” but in the age of social media she says that comments made by scholars are “so distorted and personalized” as was the case when she gave a talk about the slave trafficking of Black girls and referenced Beyoncé who she said was like a terrorist. In an interview with Diverse, West says that hooks is “a giant who will be appreciated even more as the culture catches up with her. Berea College’s president Dr. Lyle D. Roelofs says that hooks has been a welcome addition to the college founded in 1855. At 66, hooks — who never married and never had children – is still engaged in enterprising scholarship. But she is also comforted in being close to her sister — Dr. Valeria Watkins — who is also on the faculty at Berea and returning to her native Kentucky. These days, she thinks a lot about her parents. Her father was a custodian and her mother, a homemaker, who wanted the best for their children. hooks, who attended Stanford University and later earned a Ph.D. from the University of California Santa Cruz says that being back in Kentucky has felt like home. This article appeared in the November 1, 2018 edition of Diverse.